We want to encourage the adoption of this newly approved railing, the California ST-10, wherever scenic vistas are threatened by new bridges with visually opaque railings. We also hope those in other states will lobby for use of the predecessor railing, the Wyoming Rail, fully approved for use on federal highways. This site also reports on current and past efforts to oppose Caltrans projects that would obscure and otherwise harm scenic values. The story of the lengthy battle that led to the ST-10 scenic railing is in the Annotated History of New Noyo Bridge, which traces the history of the project from first public release to completion. Links in the History connect to documents, correspondence and photos. Together, these provide detailed documentation of the conflicts, positions, and roles of the major participants, with emphasis on interaction with Caltrans and the Coastal Commission. We hope to provide information and examples that will help citizens to preserve scenic values that are threatened by Caltrans projects. A final goal is to document the public process that led to Caltrans' approval of a highly scenic railing. I took it upon myself to represent those who wanted a more aesthetic bridge and railing. I participated in almost every forum in which the issues were debated and where permits were issued. This website provides a history of a victory for coastal preservation and for aesthetics over expediency and economy. It tells the story of how one individual prevailed over the largest, most powerful government agency in California. Show that one individual can make a difference, thereby encouraging more people to get actively involved in their community. 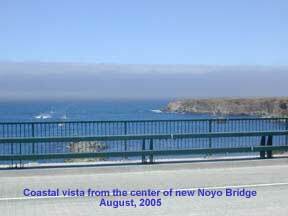 An abbreviated version of the Noyo Bridge story was published in Coast and Ocean, the magazine of the California Conservancy Association - The View from the Noyo Bridge, Vince Taylor, Winter 2007. The complete story is in the Annotated History, which traces the history of the project from first public release to completion. Links in the History connect to documents, correspondence and photos. Together, these provide detailed documentation of the conflicts, positions, and roles of the major participants, with emphasis on my interaction with Caltrans and the Coastal Commission. This website provides periodic reports on continuing efforts to ensure that bridge views are preserved and bridges on scenic Highway 1 are kept in scale with the rural, two-lane road. The Cal-Transmogrification of Scenic Bridge Railings (PDF) presents a historic overview of the deterioration of scenic railings in California, in the context of the Noyo Bridge Railing battle. the Campaign to Restore Jackson Redwood State Forest. On Friday, May 8, 2009, at 1:00 p.m. the official opening of the new Ten Mile Bridge was celebrated. The final outcome can justly be celebrated as a symbol of what community action, the Coastal Commission, and Caltrans working together can achieve. As a result of community opposition to the initial design, Caltrans worked with the community and the Coastal Commission to come up with a design that was smaller, better aligned, incorporated a pedestrian walkway, and a newly designed railing that preserved scenic views and is aesthetically pleasing. Spring 2009. Caltrans earlier (in 2005) proposed a major replacement project for the existing bridge in the small coastal town of Elk. Strong opposition from the community and the Coastal Commissions staff caused it to withdraw it plans in 2006. It is now proposed a revised plan that will replace the existing bridge one lane at a time, rather than building an entirely new bridge on a new alignment, as originally proposed. The new bridge appears well suited to its setting and has been well received by the community. The railings to be used on the bridge are still being discussed. My hope is that a suitable version of the railings used on Ten Mile bridge will be used on the Greenwood Bridge. .
August, 2005. 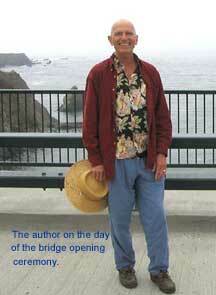 The new Noyo Bridge spanning the Noyo River in Fort Bragg, Mendocino County, California is complete. Everyone is delighted with the sweeping vistas from the new bridge and the elegance and aesthetics of the railings. The route to this outcome was not easy nor quick. The bridge immediately became embroiled in controversy when first proposed by Caltrans in 1998. The existing bridge was an unusual iron-girder, two-lane bridge much loved by many in the community. It provided sweeping views of the coastal bluffs and ocean on one side and intimate views down into a working fishing harbor on the other. The proposed bridge was a standard freeway-overpass, concrete box-girder design of immense width (wider than the Golden Gate Bridge), with solid concrete "railings" that would prevent all views of the ocean and harbor. On the one side were local citizens who felt that Caltrans should come up with an architecturally more distinctive design, a narrower bridge, and with railings that preserved the view. On the other side were others who wanted a new four-lane bridge and the economic benefits the construction would bring, and cared not at all about the aesthetics. 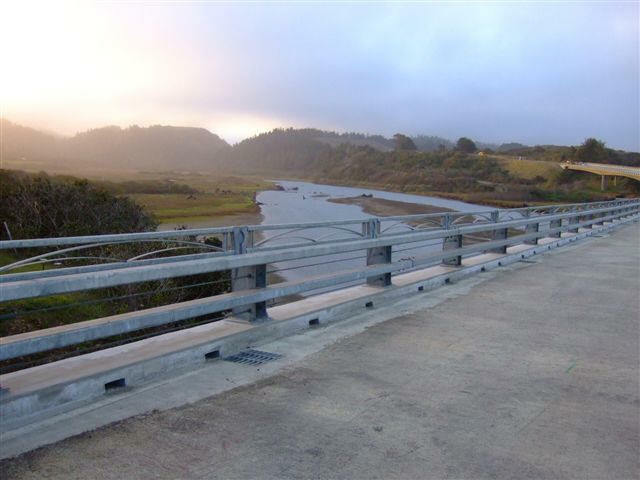 The ensuing battle over the bridge and railing design went on for 2-1/2 years, and involved Caltrans, the Fort Bragg Planning Commission and City Council, the Coastal Commission, the California Transportation Commission, and numerous citizens of Mendocino County. The final result is a testimony to the public benefit of having major government projects subject to multiple levels of review with public participation. Although the bridge width was not reduced, the overall aesthetics were greatly improved, and a truly good scenic railing has now been approved for use throughout California. The Coastal Commission intends to require use of the new steel traffic barrier on all new bridges in the Coastal Zone. Citizens everywhere in California can ask Caltrans to use the new scenic railing wherever scenic views need to be preserved. June 1, 2010. Caltrans held an open house to present preliminary plans for widening shoulders and replacement of bridge rails for 4 coastal bridges in Mendocino Count near the towns of Fort Bragg and Mendocino. The four bridges are Little River Bridge, Jack Peters Creek Bridge, Russian Gulch Bridge, and Pudding Creek Bridge. Pedestrian walkways are proposed for all except the Pudding Creek Bridge (which is excepted by Caltrans because of the pedestrian/bike trestle over Pudding Creek). The railings proposed are those used on Ten-Mile Bridge. The lack of a pedestrian walkway on Pudding Creek Bridge, which is the normal pedestrian route from Fort Bragg to the Pudding Creek beach. Also, there is still a need for Caltrans to develop an integrated design for its "ST-20 Combo Railing" which is used as a vehicle and bicycle railing when there is no pedestrian walkway. The current design, which was shown on the materials presented at the workshop, has a gap between the auto barrier and the bicycle railing. This gap presents an unnecessary hazard to cyclists. Caltrans is readying plans to replace three more bridges along the Mendocino Coast. The first step in the replacement process for two of these bridges was a "informational open house" to be held by Caltrans on Thursday, May 7, from 6:30-8:30 p.m. at the Mendocino Recreation and Community Center, 998 School St., Mendocino. 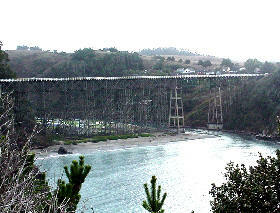 The Albion River Bridge is the last major timber bridge in California. The Albion Bridge is a magnificent monument to the ingenuity and craftsmanship of those who originally built Highway 1, a symbol or the timber era of Mendocino County, and a precious historic asset of California. The reasons for replacing the Albion Bridge have not yet been made clear, but the reasons for preserving it are already clear. If you are interested in helping to preserve this bridge, through expressing your support for preservation, please fill in your name below. The Salmon River Bridge is located over the next canyon south of the Albion River Bridge. It was built later (1950) and does not have the historic significance of the Albion Bridge, but its replacement needs to be considered simultaneously with that of the Albion as they are important elements of this unspoiled section of rural coastal Mendocino. This website has the materials presented in Mendocino on May 7 at the workshop on the Albion and Salmon Creek Bridges. May 2006. Perhaps the most important action for preserving vistas was taken recently by the national highway standards organization (AASHTO). At its May, 2006 meeting, the bridge committee lowered the railing height for bicycle railings from 54" to 42", the same height as pedestrian railings. This change will improve enormously the aesthetic possibilities for railing designs. This is important for Ten Mile Bridge and all other bridges on Highway 1 where combination auto-bicycle railings are needed. Use the form below to sign up for email updates and to send comments or questions. We will only email you when there is important new information. Your information will not be used for any other purposes than to reply or send update notices. Your information will not be shared with any other organizations without your permission. To prevent Spam Bots from signing up, we have had to implement a countermeasure. Please copy the letters in the image into the box below. Thank you for your interest and/or help. Copyright Vince Taylor, 1999-2006. Photos by Vince Taylor unless otherwise credited. Right to for non-commercial use is hereby granted, conditional upon granting of credit and referencing of the website.